From soccer on the big screen to right on the Seminoles field, get ready for a week of cheering on your favorites. If you haven’t heard about Drip Drop Fitness you might be living under a rock… but here’s your chance to try something new as they’re offering their first class FREE for the month of October. This is the perfect opportunity to not give up your new year resolution, and finish 2018 strong. Hometown heroes Mayday Parade return on the “Welcome to Sunnyland” tour in support of their brand new album. Gather your friends and put a team together for what is sure to be a hilarious night of trivia. October 4th is opening night for the National Hockey League. That means food, big beers, and hockey on multiple screens. If you are a hockey fan who might be interested in playing hockey stop by Township for a beer and introduce yourself. This game will feature the annual Paint It Pink match. 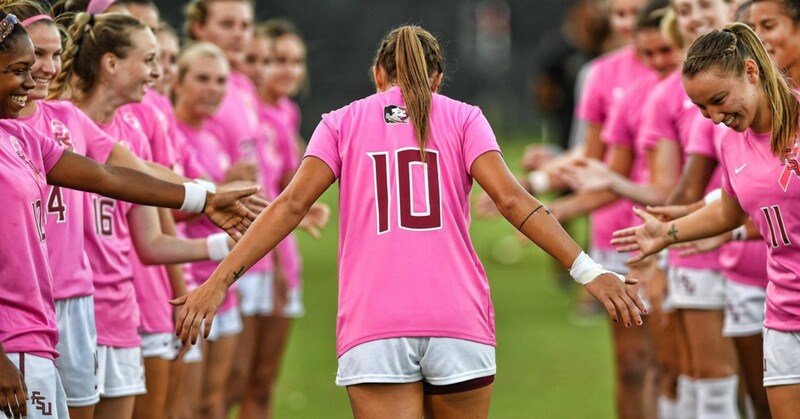 FSU players will wear custom pink jerseys, which will be auctioned to raise funds for the TMH Breast Cancer Center. Fans can purchase Paint It Pink t-shirts and the proceeds will be donated to the fund as well. Midtown Reader will welcome poet Erin Hoover for a reading and signing of her new poetry collection, Barnburner. Come and enjoy a feature presentation of the 1968 classic Night of the Living Dead on the lawn of the Bellevue Plantation House. Bring a blanket or a lawn chair. Also enjoy wildlife tours, night zip lining and pumpkin dropping. Happy Motoring’s own Amanda Morrison will be leading an hour of relaxing vinyasa on their lawn. With two stages, demonstrations, dragon dancers, food and so many activities throughout the park for kids, this is surely an event not to be missed. Admission is FREE! Head out to Bumpa’s to see if Manchester City can finally win at Liverpool.